Installation work is wrapping up after a week long sprint to improve WIFI coverage in East Hill and Horan Residence Halls. 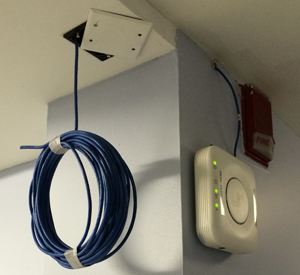 Upon returning from Spring Break, students in East Hill and Horan will be greeted by improvements made to the buildings' WIFI infrastructure. Installation work will be wrapping up mid-day Sunday after a week-long sprint to make improvements while students were away. WIFI coverage was effectively doubled by a mix a new WIFI access point installations and optimized locations. Additional deployments were installed top-down in both buildings. Returning students on higher floors (11,10,9,8...) will notice newly installed devices in many more locations, while students on lower floors (2,3,4,5...) will see in-progress wiring awaiting access point installation. Remaining locations will be completed throughout the coming days. Installations on lower floors that are not 100% complete may show ceiling mounted boxes like these where an access point will be installed. Other locations may be awaiting installation of these boxes later this week. Rest assured, our plans include upgrades to ALL FLOORS. Installations will resume on Monday, but will be deployed slower to ensure minimal disruption to students living on these floors.